Biscayne National Park is a remarkable area in far south Florida, protected for its “rare combination of terrestrial, marine and amphibious life in a tropical setting of great natural beauty”. It is remarkable among National Parks as 95% of the park is covered by water. The coral reef which is protected within these waters is part of the third longest barrier reef system in the world. A part of that reef became exposed long ago, forming the barrier islands on the outer edge of the park. These islands are a part of the Florida Keys, although since they were never connected by rail or highway, they have remained relatively isolated. This isolation does not mean they have not had visitors though. Both John James Audubon and Robert E. Lee visited these outer islands in the 19th century. In the 20th century, the upper keys hosted wealthy businessmen and 5 sitting or future U.S. presidents. 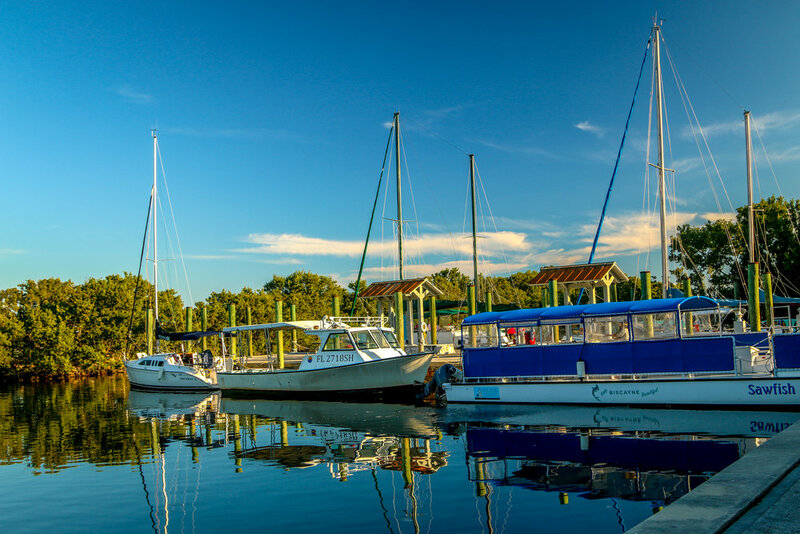 In the fifties, proposals were put forth to develop these upper keys, connect them with a highway to the mainland and build a city to be called Islandia. Thankfully (in my opinion), this development never took place, as a small but vocal group called for protection as a national park instead. Through their efforts,this area became a national monument in 1968, and a national park in 1980. To really see Biscayne National Park, you need to get out on the water. If you don’t have a boat of your own, you can travel from the visitor center into the park as I did on boats run by the Biscayne National Park Institute. They offer snorkeling, kayaking, sailing and exploration trips daily. I chose to do a snorkel trip and a tour to Boca Chita Key while there, and both trips were excellent. Both trips had a naturalist on board the boat to explain the history and ecology of the park and point out any wildlife we saw along the way. On the day I was there, we saw manatee, dolphins, iguanas and many species of fish and birds. It was a wonderful day in the park and I highly recommend these tours if you are in south Florida. I hope you enjoy these photos from Biscayne National Park. These are a part of my In Focus series which tries to take a more in-depth photographic look at our wonderful National Parks. To see more from this series, simply find the “search” bar in the footer of this post and type in “in focus”. In the interest of full disclosure, these tours were arranged for me by a friend who works for the Institute, but all opinions are my own. Welcome to Miles2Go and thank you for coming along for the ride. I’ll send you a newsletter every Thursday so you can keep up with my slow journey around the country. Thanks again.